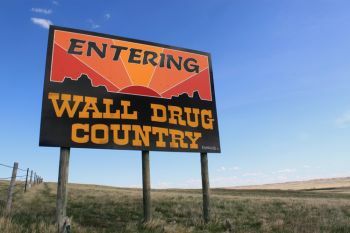 Where the heck is Wall Drug? It’s a question that lurks, like heat squiggles over the asphalt, on the margins of South Dakota highway horizons — always somewhere up ahead, until it isn’t. As Interstate 90 unfurls into the Badlands from either, greener direction, the Wall Drug experience has established its imminence through incremental creep. The signposts form an outline. As you catch up with the miles ahead, imagination fills in the increasingly arid open spaces. As the wheels turn, jagged layer cakes of geologic epoch expose themselves in rainbow bands, like color-coded race tracks for tiny ancestral horses. Somewhere out there Eohippus tries to close the gap on Mesohippus in the final lap. As I-90 rolls you back into a distant past, you find yourself in a prehistoric diorama with strange roadside attractions where ice water accumulates the exotic cachet of a saffron stigma. It all started with ice water. Before the signs stretched to Wyoming and Minnesota like squares in a graphic novel told across untold acres, it started with ice water. The early signs were text only. Free ice water was a big enough draw. They worked almost instantly, saving a struggling business in the midst of the Depression. Over the decades, the signs and the store grew together, expanded, became more elaborate. Ted and Dorothy’s son Bill was the visionary. He transformed the store into a Badlands oasis teeming with folklore as magical and organic as a jackalope pack hopping across a craggy ravine. Sign artists Dobby Hansen of Philip and Mike Kurtz of Rapid City, and others, built on the original idea and created what became an instantly recognizable aesthetic, populated with occasional, colorful frontier characters, as at home in the Badlands as a prickly pear or porcupine. In 1991, Barry Knutson of Philip (originally from rural Haakon County, near Grindstone) — a carpenter/newspaper editor/National Guardsman — who had taken some art classes at SDSU began his own sign startup and, before he really even knew what he was doing, went right for the Big One next door. 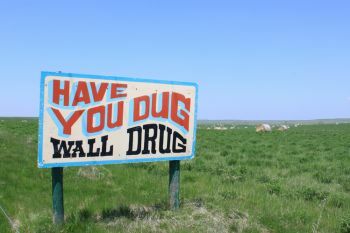 In the early years, Knutson the artist had to hold back a little to stay within the Wall Drug tradition of text-heavy, for road read-ability, signs. As he became a better sign painter, he gradually sold the Husteads on more figurative artwork, starting with imagery from classic Wall Drug post cards and updates on the occasional classic sign that did include imagery. Knutson is obsessive about finding the right balance, and sweats every detail. He learned everything he knows about signs from on-the-job experience, developing a meticulous set of SOP’s some sign painters might consider wasted time. He always paints them on a flat surface, not standing up against a wall. “We’ve tried both. We can put a thick layer of paint on them [when they're laying flat] so they have a glossy finish when we’re done. And they hold up so much longer.” Longevity is a big part of the equation. 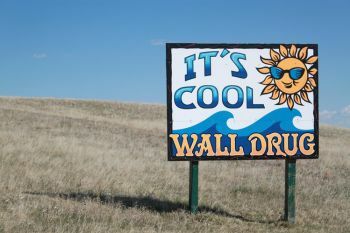 Wall Drug is not a faddy brand. Designs can last decades. Signs do too. In a quarter decade of painting Wall Drug signs (as well as signs for Al’s Oasis, the Ranch Store and other assorted attractions), and (currently) as the sole visual ambassador from Wall Drug to the highways of the upper Midwest, Knutson and family — Edna Knutson (a First Lieutenant in the South Dakota Army National Guard’s Medical Command), and daughters Kianna and Katlin — have made an unmistakable imprint on an iconic brand. They’ve changed it. They’ve kept it the same. 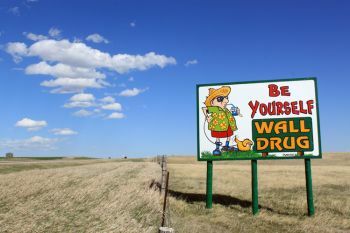 “With Wall Drug, you want to keep up with the new trends, but you’re almost not allowed to without losing who you are,” Knutson says. “So that’s always been a challenge. How much can we do? How far can you go without changing who you are and what people expect you to be? I think right at first when I started doing signs, I was like, I’m going to change Wall Drug a little bit. And once I started doing that I really realized what Wall Drug is. It’s the tradition. 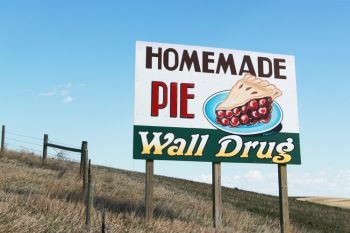 That’s the existential Wall Drug sign question: how to honor the tradition while keeping it a living tradition? Knutson talks about that problem like a man who thinks about it, all the time. And it shows. The Knutson family has walked the line. Do they realize that their collective vision has become an intrinsic feature of the South Dakota travel experience, as indispensable as antelope herds or a giant concrete prairie dog? Maybe sometimes. Occasionally tourists, mostly European, walk in to the sign shop. Barry Knutson, the meticulous man from Grindstone, who never cuts a corner to save time or effort on a sign, has created a roadside story that infuses the road ahead with wonder, sometimes with a question — like the groovily lettered “Have You Dug Wall Drug?” Or with happy-at-home gumbo country friends — like the potbellied cowboy bathing in his happy horse’s watering trough. His South Dakota story offers a link to an imaginary past — the only kind of past that’s happy. 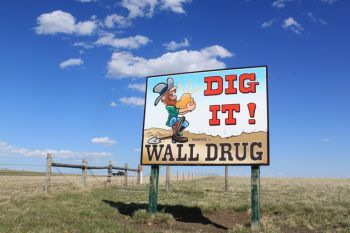 In letters and characters, his Wall Drug signs build up over the miles into an episodic tableau — a story of South Dakota the traveler co-authors along the way. Great story! Barry is kind of an inspiration. We should all aspire to do more and improve on whatever it is that inspires us. This story brings back memories of family trips from eastern South Dakota to visit relatives in Rapid City. We would watch for the Wall signs to see what was new from the last trip. Whether it was Wall Drug, Reptile Gardens, or Mt. Rushmore the signage across the state helped keep us entertained and watching for the next one.